A series of NAMI links including one on living with schizophrenia. NAMI has released the results of a survey that reveals surprising results about how people living with schizophrenia use digital technology to manage their illness. 2015 was an important year for NAMI. To learn about all of the details of the financial year and our stigmafree campaign take a look at the 2015 annual report. NAMI CEO Mary Giliberti makes a statement to address mental health appropriations to the Labor-HHS-Education Subcommittee of the U.S. House of Representatives. This blog post discusses the role that self-care through art can play in monitoring mood changes and symptoms and progressing on the journey of recovery. NAMI AIR (Anonymous. Inspiring. Relatable.) is a free mobile app designed to support individuals living with a mental health condition(s) and caregivers/family members who wish to connect with and inspire others by sharing their mental health experiences. This month has been eventful as far as new research studies being talked about in the media. Learn more about up and coming studies. 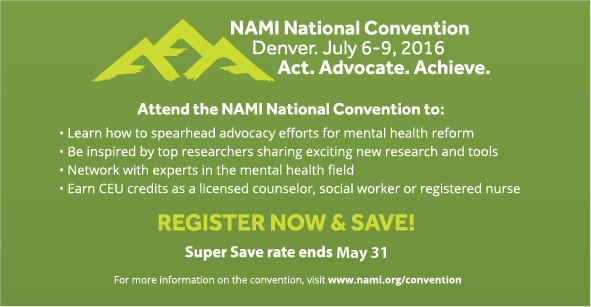 The 2016 NAMI National Convention, July 6-9 in Denver, is the largest community-driven gathering of mental health advocates in the United States. The convention educates, encourages and empowers a diverse community that is passionate about building better lives for people affected by mental illness. Nancy Pizzo Boucher uses a narrative of her son’s experience with a distressed skunk to reveal how better outcomes are possible when police respond to mental health crises. 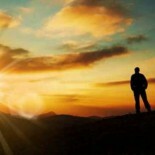 Do you find it difficult to stay productive when you are experiencing depression? Here are several ways to avoid isolation and reduce symptoms during a period of depression. A contributor shares a personal story revealing the effects of depression on their daily life and details the pain of losing everything due to stigma about treatment. A contributor recaps her experience with the NAMI Family-to-Family educational program and offers an uplifting perspective on its impact on her life and others. A contributor shares a personal story about their challenges with symptoms of depression and urges others to take charge of their mental health. This entry was posted on April 28, 2016 by wjlanier in NAMI Articles and tagged nami.